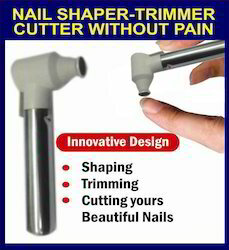 This cushined buffer with 4 functions in one perfectly follows the curve of nail and mekes polish fast & easy. simply files, polishes and buffs as following 3 steps and leaving your nail a salon shine. 5 Items Manicure Set in Exclusive pouch. (Duration: 45 mins / 60 mins)Great products with expert application techniques makes your hand and feet brand new Product Used : Signature soak, scrub and mask Recommended for : MEN!! Choose from wide a range of manicure options at Naturals salon which include a Spa Manicure, a Radiant Manicure for whitening and an Intense Moisturising Manicure for dry feet or just opt for Nail basics like cut, file and change of polish. This vega cuticule trimmer and pusher keeps your nails and cuticules looking at their absolute best. The angled end follows the curve of your cuticles and gently pushes them back. The unique metal-V end neatly trims the dead cuticle around the nails. The soft touch rubber handle profices a comfortable grip and prevents sliding during use. A manicure is a cosmetic beauty treatment for the fingernails and hands. A manicure consists of filing, shaping of the free edge, treatments, massage of the hand and the application of polish.